Replace all broken and damaged tiles. Pressure clean all dirt, moss, lichen and fungus from the roof. Re-bed capping tiles where necessary. Apply flexible pointing to all capping. Prime tiles with Primabond to stabilise surface. Seal tiles and capping by applying a sealer coat. 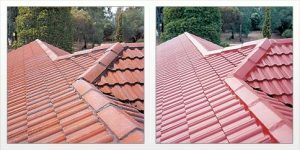 Modern Cement Tile Roof Restoration provides an effective way to transform the appearance of your existing roof tiles and help reflect heat away from your roof surface. Using The Sheild System and Supablock paint you can reduce your cooling needs and enjoy the benefits of continued savings. Over time terracotta or Spanish roof tiles Los Angeles attract moss and become soft and being naturally moist, they retain more moisture than cement tiles as the moss builds up. At Modern Roofing Los Angeles we take pride in our work and ensure the job is done right, the first time, without the use of coatings or paint used in the market. That’s why we have developed a unique maintenance service and range of repair services to restore your terracotta tiles as good as new and allow you to have the best looking roof on the street.